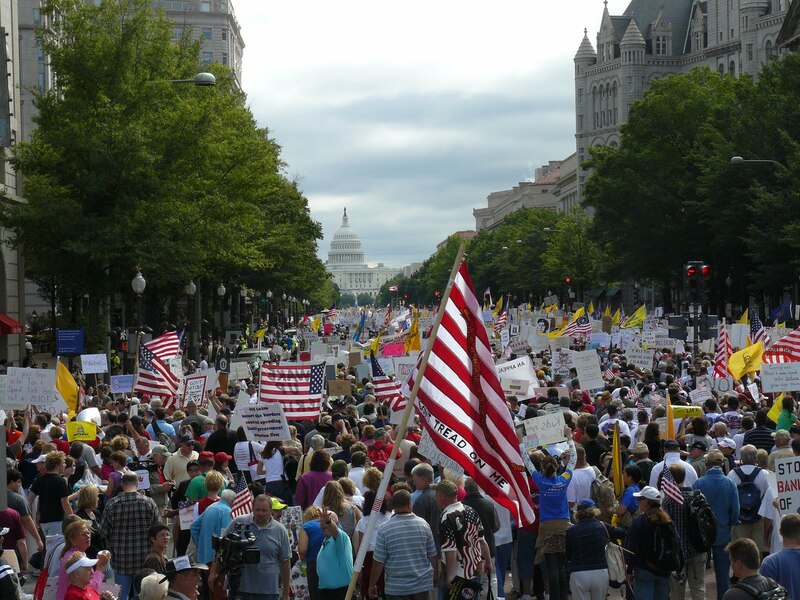 Retired Colonel Harry Riley via Patriots of America has announced “Operation American Spring,” a march on Washington this May intended to oust the Obama administration. I completely understand the desire to overthrow these louts. It’s not just Obama and Democrats, there are a lot of Republican enablers that should go too. I know people are at their wit’s end and searching for bold solutions. The OAS plan, however, is ill-conceived, shows terrible judgment and in all likelihood will not bring about the intended results. In fact, it will destroy the very Republic we are trying to conserve and discredit conservatives forever. “Phase 1 – Field millions, as many as ten million, patriots who will assemble in a non-violent, physically unarmed (Spiritually/Constitutionally armed), display of unswerving loyalty to the US Constitution and against the incumbent government leadership, in Washington, D.C., with the mission to bring down the existing leadership. Go full-bore, no looking back, steadfast in the mission. Phase 2 – One million or more of the assembled 10 million must be prepared to stay in D.C. as long as it takes to see Obama, Biden, Reid, McConnell, Boehner, Pelosi, and Attorney General Holder removed from office. The senior republican in the US House of Representatives will become Speaker of the House and the US House of Representatives will elect a temporary President and Vice President of the United States. The U.S. Senate will take action to elect a new majority and minority leader. As required, the U.S. Congress will execute appropriate legislation to convene new elections or U.S. States will appoint replacements for positions vacated consistent with established constitutional requirements. Phase 3 – Those with the “principles” of a West, Cruz, Dr. Ben Carson, Lee, DeMint, Paul, Gov Walker, Sessions, Gowdy, Jordan, will comprise a tribunal and assume positions of authority to convene investigations, recommend appropriate charges against politicians and government employees to the new U.S. Attorney General appointed by the new President. The second and third phases show an alarming lack of understanding of our Constitutional Republic (despite the asterisked qualifier) and a terrible lack of foresight. This by definition is an unconstitutional means of trying to transfer power. It is more along the lines of insurrection or secession or worse, the French Revolution. Many might be on board with either or both of those, but that too shows a total lack of foresight and good judgment. It is very likely that the representatives mentioned in Phase 3 would absolutely oppose these methods. OAS is laid out as if the whole thing will happen in a vacuum without opposition. It is highly likely that Obama would use such a protest to his own advantage, and he could do so in all sorts of ways. He can argue how extreme conservatives are that they would use unconstitutional means to bully duly elected representatives they don’t like out of office (and he’d be right). He can afford to wait out protesters who will supposedly “stay as long as it takes,” thereby completely undermining their mission. Then the headlines will be “OAS Fails, Leaders Embarrassed.” 1.8 million may have already signed up, but once the action begins, few of them will actually be willing to lose their jobs, their homes (especially those with families to consider) or to suffer the discomforts of living on the streets of Washington D.C. for a protest that at best will be completely ineffective. This is not a comment on a Patriot’s resolve, this is a recognition of human nature. Surely a colonel, of all people, should know how precarious keeping people together and focused on a mission can be, in the best of conditions. Add in bad living conditions, hunger, conflicting egos, potential violence, and you’ve got a big fat mess that professional military leaders themselves often have a hard time mastering. …can easily end up like this. Who’s calling the shots here, whether it’s for one or ten million people; Col Riley all by himself? Who else? What qualifies them to lead an action like this? Will they be responsible for the people who, as Riley says, may die in this endeavor? That is a responsibility true leaders must bear, especially those instigating a rebellion. If not, it’s every man for himself, a recipe for mayhem. How exactly will those listed be “removed” from their duly elected offices? This is supposed to be a peaceful and unarmed movement, but such a thing cannot be done without force. Nor can it be done constitutionally via a sit-in, however long it may be. How will they deal with and respond to opposition or counter-protest? Leftist Occupiers are much better at this than conservatives, who are already predisposed with a solid sense of responsibility. The Obama supporters likely to mobilize are also particularly adept at goading, they are unafraid to use violence, of get hurt or arrested. It won’t matter that this is supposed to be an unarmed, peaceful protest. Once something starts, it won’t matter that the conservatives who before have never instigated violence and have left the Mall spotless, didn’t start it. What will they do if the people, as mobs are apt to do, get out of control? How will they respond when Obama sends in the troops to clear the city as Hoover did against veterans during the Great Depression? The protesters will then have instigated a stand-off with the American military which has a grave potential of ending very badly for all. 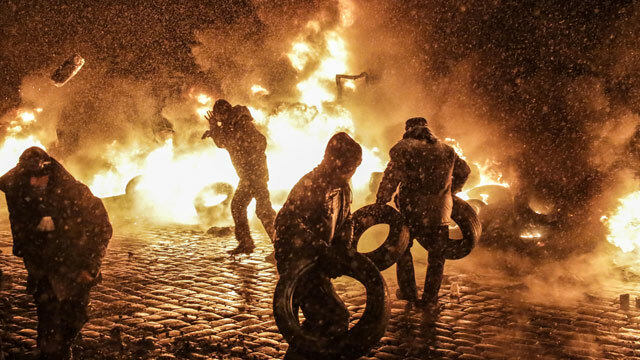 What if the administration decides to declare martial law because of this “insurrection?” How will either the protesters, Americans, or our Constitutional Republic benefit? If OAS gets as far as ousting the administration, how will they (all 1-10 million of them) control what happens next? Who is to say that all 534 in the House of Representatives could come to agreement on who the temporary president and vice president should be? How will the government not devolve into complete chaos while the administration is being replaced? Have they considered the international repercussions of sending our government into complete chaos? How will the votes of the newly convened elections be counted and how will voter fraud be avoided and accounted for? What will these people do if the votes don’t go the way they think they should? What can they do to ensure order and non-violence indefinitely, “as long as it takes”? If OAS succeeds, it paves the way for this kind of ouster by liberals of conservatives duly elected to office. Conservative patriots fighting to save our country from this administration stomping all over our Republic and the liberties it guarantees would agree, that’s not what we want. In his (rather badly written) announcement, Col Riley asserts that we are past the point of no return, among other platitudes. I would argue: not nearly. Yes, this administration is destroying our country. Yes, our supposed representatives in Washington D.C. are defying the Constitution and Declaration of Independence and flouting our laws. Yes, they are tyrannical and corrupt. But all that, which has been obvious to conservatives since Obama jumped into the running in 2007, is becoming obvious to many, many more Americans. The administration is being exposed more every day for its corruption, and the people are waking up to the mistakes they have made in voting for this president, Democrats and establishment Republicans. It’s more than just conservatives who are now seeing through the sham that is political correctness. America and her citizens are very resilient, just look at Scott Walker’s Wisconsin. Fomenting a rebellion just when the administration is crumbling on itself is the stupidest thing anyone could do. This “plan” is no plan at all, and the very people they want on their side and more will turn resolutely against them for it once the dust has settled. Operation American Spring won’t save the Republic, it will destroy it. Conservatism will be completely discredited because all conservatives will be lumped in with Col. Riley and his thoughtless, rash cohorts. This is not pledging lives, fortunes and sacred honor to the cause of liberty, it’s throwing all of those away for confusion and mayhem that has a very high potential for leaving us much worse off afterwards. Our best avenue to restoring free America is to persuade people to conservatism, to stop voter fraud and win back the country through elections, the peaceful transfer of power. Well said, Jude. There is MUCH to consider with this approach. I hate having to do the hard work of becoming informed and sharing information and convincing others of truths of which they should already be aware. But, I don’t want to lose the Republic to mass chaos and destruction. We must be willing to become informed, debate our points and expose the truth of indoctrination no matter the energy it will require and time it will take to succeed. I wonder how many Americans care enough to do the hard work. Earnest Prayer must also be a major part of our approach to saving the Union for freedom loving Americans. I have read this, let’s say I agree, which is only for this, What do you suggest, We have a government that is not listening and is everyday removing more and more of our constitutional rights! These people in Congress and Givernment are clearly not living up to their oath of office which is to uphold the constitution. Liberals can dispute this all they want, justify all they want, but the second amendment is not debatable! We are allowed to have arms to protect us from our government! end of story! If they want that changed them have a constitutional convention, write a bill sign it send it to Obummer, I know he’ll sign it and the send it to the states for a 2/3rds approval, that’s how the amendment process works, not by sining an agreement with the UN to circumvent this process! But, did you people remember that all those vote’s WAS RIGGED too !! So, do you believe it will change ? I don’t ! I know, that is a serious problem, one we have to fix state by state. In North Carolina we have made headway in this regard with voter ID requirements, and more voter fraud is being exposed. I wish the organizers of OAS would at least postpone it until after the November elections. If there is more voter fraud (of course there will be some), it will be obvious, and then Col. Riley may be right that we’re past the point of no return, but we’re not past that point yet. As we are finding out, the voting process has been breached and we will not win any elections unless it is a mute position or a fraudulent imposter placed there by NWO. Do you expect me to believe for one minute that 3 million LESS Republicans showed up to vote for the most important election in history, than the election prior? Unfortunately, the Col. is right, it’s gone too far, but we should also learn from history and know how to handle the enemy, foreign and domestic. I think our ancestors would tell us, ‘not to go to war with our fellow man’ but ‘go for the heads to kill the beast’. WORDS are PLENTIFUL….DEEDS are PRICELESS. “Obama’s words”,… though POLITICALLY CORRECT…are GROSSLY INDECENT and BIBICALLY … INCORRECT… PERIOD. his FAILED LEADERSHIP, promulgated by his Administrative CZAR’s, AND The Democratic Senate, “IS a CLEAR and PRESENT DANGER”…To Our Great Nation …PERIOD. “We The People’s REVOLUTION is The SOLUTION…PERIOD. We Can Take America Back…PERIOD. May God continue to BLESS OUR AMERICA, undeserving as we are now. I see you may have a good thought. But, what if our forefathers thought like that? We would still be British..
You arguments have no merit because we no longer have a Constitutional Republic form of government. 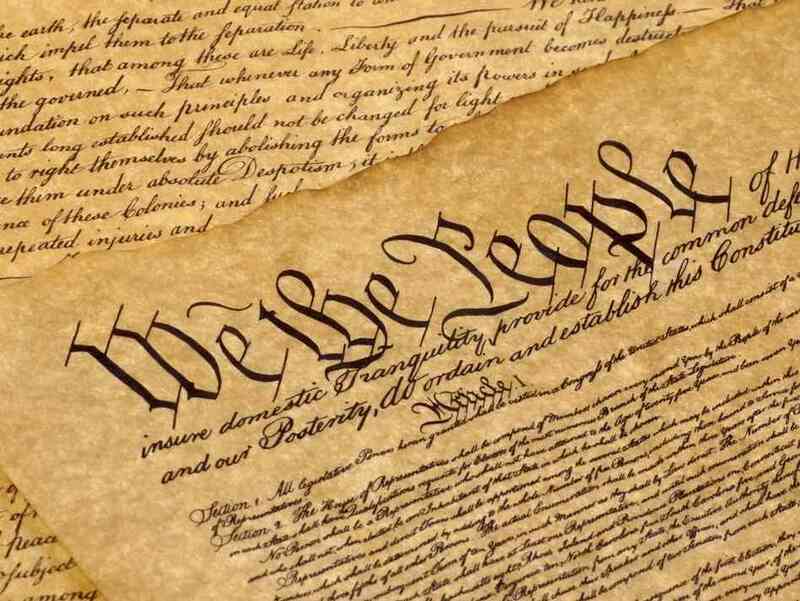 The Constitution is on it’s last breath and is ignored by our President and elected representatives. We now have a Socialist Democratic form of government. Unless we exercise our rights and duties under the second amendment we will go the way of the Roman Empire. The problem is the whole damn Congress not just the President and his cronies. Since the Act of 1871 this country has not had a legitimate Constitutional government serving the people of this nation, it’s simply a Defacto government set up as a CORPORATION after the quorum was lost when southern states walked. The entire CORP needs to be replaced and placed back into the hands of the legitimate Dejure government. The defacto government got the states to buy into it by bribing the individual states with money to rebuild after the civil war and have continued the same policy since. Until recently states are starting to see the federal government for what it is and passing their own laws according to the real constitution to nullify some of the federal laws or regulations. The power is in the states, it is the states that should be putting the defacto federal government in it’s place but unfortunately to little state politicians know about the true history of our nation and what the Act of 1871 did to it. Sounds like what some anarchists tried do with a failed co-opting of the Trucker’s Ride to DC just after the Biker’s Ride last fall. Similar government “replacement verbiage.” Caused the real Trucker’s promoters much grief. While I share the frustration with the current Administration, I can’t be more strongly against this “American Spring” idea. It has no basis in the Constitution, and such a march could easily be turned violent by relatively small numbers of violent anarchists or the other side’s provocateurs trying to provoke a confrontation between protesters and the government. The aftermath of such would be a discredited Liberty movement and a government that can finally point and scream “right wing terrorism” to the media-hypnotized multitudes and begin its evil works in earnest. The Big Government (Let’s call it what it is, Totalitarian) mentality must be defeated, but as long as it can be defeated at the ballot box, and recent events suggest quite strongly that it can, then that is where it must be defeated. I realize that this requires patience and that’s a commodity in scarce quantity these days, but Liberty itself is at stake. Some Old Roman and Jude Eden, I would dream that voting alone would solve the current problem. Personally, I really think that not an American Spring is the Answer, not another vote to replace someone with the lesser of two bad choices, but a fresh approach using a different answer is what we need. The approach I and many others are advocating is in the constitution. Placed there by the framers for just such a time when elections don’t seem to work because the existing government is the proble. No I am no advocating revolution. I am advocating self governance http://articlevprojecttorestoreliberty.com/index.html the site has a huge library of verified reference material, both written and video. Please tell me what your thoughts are.